The NFRC Professional Book Discussion Group, a Professional Development service and benefit for members of the Niagara Frontier Reading Council that launched at the 2013 Fall Mini-Conference, met four times this school year to discuss in depth, Great Habits, Great Readers. Members received this professional text/practical guide written by Paul Bambrick-Santoyo, Aja Settles, and Juliana Worrell (Jossey-Bass, 2013) as part of their 2013-14 membership package. The first year of the Professional Book Discussion Group met with great success as evidenced by the enthusiastic feedback of members who participated in the discussions. An average of 23 members attended each of the four meetings. Discussions of specific portions of the book were announced via NFRC communications and led by Carol Bush, Patty Oliphant, Kathleen Montesanti, Mary Beth Scumaci, and Judy Bradbury. The NFRC thanks all those who volunteered their time and efforts to prepare and assist with leading the book discussion group meetings. Thanks also go to member Lisa Insalaco for securing a location at which to hold two of the book discussion group meetings free of charge. As we look forward to Year Two, the NFRC PBDG committee is requesting your feedback. We are considering holding a “one-off” meeting in the fall at which time members would bring favorite benchmark texts to share with the group. Following the meeting, a list of the books discussed would be disseminated to the group. Also being considered is the possibility of conducting book discussions online in addition to holding periodic face-to-face meetings. Finally, the committee is searching for books or articles that might be of interest to discuss in-depth. If you have suggestions, thoughts, or comments, please send them along. The PBDG committee will meet in early summer. Care to join us? Members are always welcome. Contact me at judyreads@bluefrog.com. *Please note: You must be a member of NFRC to participate in the Professional Book Discussion Group. For Professional Development news, information, and resources compiled by Judy Bradbury for the NFRC, please visit the Professional Development page on the NFRC website at www.thenfrc.org. Contact Judy at judyreads@bluefrog.com with professional news you’d like to share with colleagues in our organization. If you have suggestions for future selections for the PBDG, please bring information on the book to the meeting or send it to me at judyreads@bluefrog.com. The PBDG committee will be reviewing suggestions in late Spring. 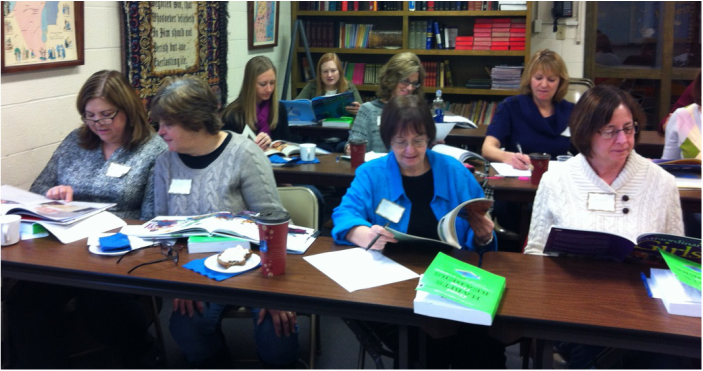 The Niagara Frontier Reading Council Professional Book Discussion Group launches at the Fall Mini-Conference! Be sure to save the date and plan to attend the NFRC’s Fall Mini-Conference on October 5, at which we have plenty planned! One part of the exciting morning program is the distribution of the first pick for the NFRC Professional Book Discussion Group! Sign up for the Fall Mini-Conference and receive a copy of the book at no charge! 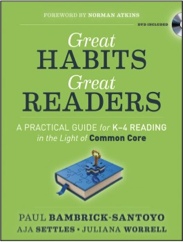 Great Habits Great Readers is Paul Bambrick-Santoyo’s latest publication. You may be familiar with this leading author in the field from reading his highly acclaimed previous books, Driven by Data and Leverage Leadership. After reviewing several possible resources, we chose Great Habits Great Readers because it offers practical tips for building competent reading habits in our students. Written in an accessible style, the format of the book lends itself well to discussion among professionals in the field. A DVD is also included. At the Fall Mini-Conference we plan to launch the NFRC Professional Book Discussion Group by giving you an overview of the book’s content, familiarizing you with its structure, and focusing on a strategy the author outlines early in the book. You’ll get a taste of the book discussion group. But this is your group! We will survey members as to preferences in time of day, day of the week, length of meetings, and preferred locations. We’ll collate the results and work to tailor the group’s structure to satisfy the preferences of the majority of participating members. We’ll also ask you for input in choosing titles for future selections for discussion by the group. As we progress, let us know if the NFRC Professional Book Discussion Group is meeting your professional needs and offer suggestions on how we can make it better! You can contact me anytime at judyreads@bluefrog.com. Place NFRC PD in the subject line, please. Judy Bradbury is the Professional Development Chair for the Niagara Frontier Reading Council (www.thenfrc.org).